CAUTION: A VERY AGGRESSIVE STINGING INSECT!!! Bald-faced hornets are social insects, although not true hornets. They live in colonies that may contain between 100 and 400 members at their peak. They usually appear in late summer when populations are largest. Unlike other stinging insects, bald-faced hornets do not reuse their nests season after season. Bald-faced hornets build paper nests at least three or more feet off of the ground, usually in trees, shrubs, on overhangs, utility poles, houses, sheds or other structures. These nests can be as large as 14 inches in diameter and more than 24 inches in length. Bald-faced hornets are aggressive and will attack anyone or anything that invades their space. This makes bald-faced hornet removal somewhat difficult. These hornets have smooth stingers, so they can sting over and over again. Bald-faced hornet stings also carry venom that makes the stings hurt, itch and swell for about 24 hours. 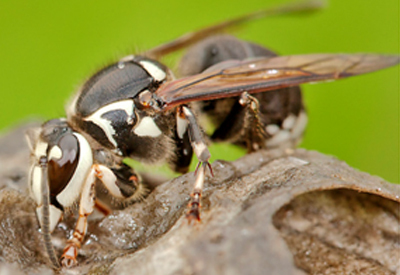 Humans are at the same risk of allergic reactions from bald-faced hornet stings as with other insect stings. If you find a bald-faced hornet nest on your home or property, do not attempt to remove it on your own as this can aggravate the colony and cause the hornets to sting. Contact the Arrest-A-Pest professionals about hornet removal to avoid the risk of bald-faced hornet stings.